I got the idea of making this tikki after going through a post in www.foodily.com. I know that making a tikki needs patience and I am not that good in making this one so far. The post I saw was a Quinoa & beef patty. I just took the idea of using quinoa in making tikki and used it here as per my whims and fancies. Here goes the recipe for making Quinoa-Potato Tikki. Maida/Corn flour - for coating. Take a wide bottomed vessel, add all the above ingredients one by one. Mix it nicely with hand. Make lemon sized balls out of it and keep it aside for 10 minutes. I made little bit bigger balls. With the above mentioned ingredients, I could make 7 tikkis. Heat a tawa with couple of tablespoons of oil. Now flatten the balls one by one in to one inch thick patties. sprinkle maida/corn flour/roasted sooji on top of it and cook it on medium flame so that both sides cook evenly. Add oil accordingly so that we get the crispy consistency. Leave it for few minutes so that it sets. This tikki recipe goes to fab-fast-food event. Please check out the Eat your veg and Bangers & Mash for the details of this month's challenge. 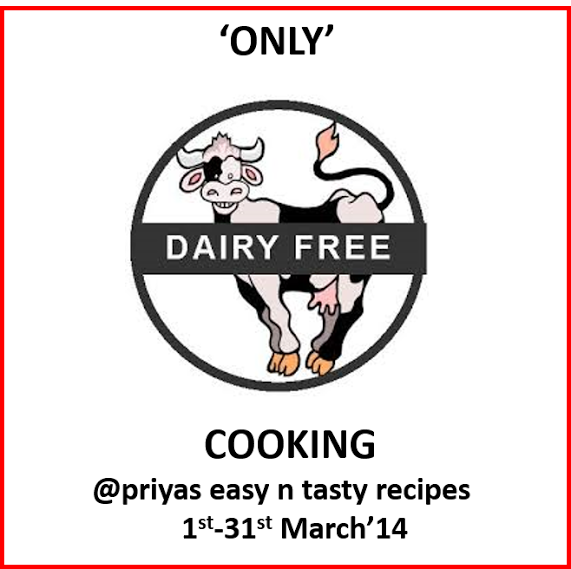 And also to Pari's Only Dairy Free Event. This month this has been hosted by Priya. Very interesting and healthy idea to make tikkis!